I had a random thought one day while eating rice noodles. I was particularly interested in how rice noodles take on a semi-transparent look when cooked. This observation led me to wonder how they would look on the light table. Of course, me being me, I went one step further and dyed the rice noodles. I was hoping that the noodles would remain somewhat transparent when dyed, making them a fabulous candidate for some sensory play on the light table. Although they didn't quite work out as well as I had envisioned, I was still delighted with the results. 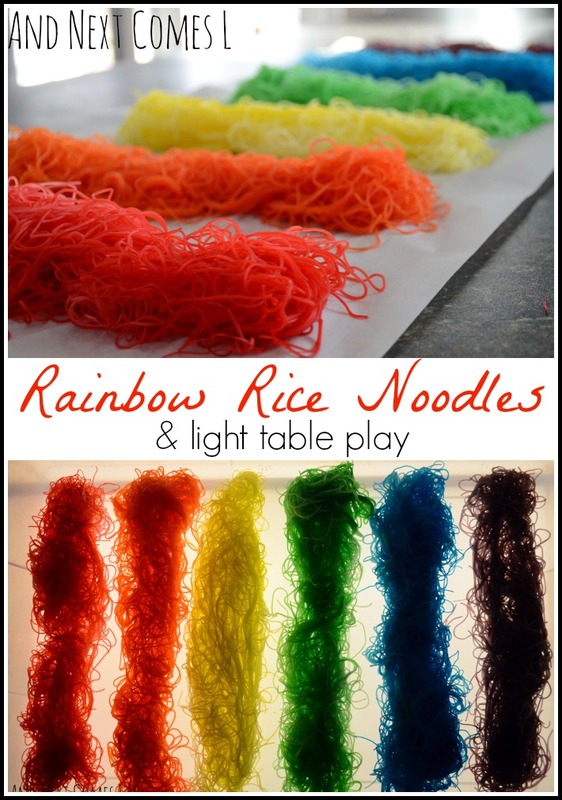 These rainbow dyed rice noodles were squishy, colorful, and oh so fun to play with. And I was just a wee bit obsessed with taking pictures of them. As you can see, the noodles took on a rich, vibrant hue. Each strand was beautifully coated in intense color. Fabulous, isn't it? Dying the rice noodles was straightforward, similar to how I've dyed regular pasta or rice in the past. I used a package of rice vermicelli noodles from the dollar store and cooked them according to the directions on the package. Once the noodles were cooked and they had a chance to cool a bit, I split it up into six piles. Using a plastic zip seal bag, I placed the noodles in, along with a splash of vinegar and about 10 drops of food coloring (use more or less depending on the color you want). I then let the boys shake and squish the bags of noodles until the noodles looked evenly coated. Then I let the noodles air dry on some parchment paper for an hour or so before patting them dry with some paper towel. Basically, I let the noodles dry long enough for the color not to rub off on my hands. I wanted the noodles to remain wet for playing with. Have you seen how crunchy rice vermicelli noodles get when they dry out? Yeah, not really fun. Squishy, wet noodles, on the other hand, are fun! Super fun! So I laid the rainbow dyed noodles in our sensory bin, following the order of the colors of a rainbow. There's just something so magical about rainbows. Now it was time to try out my original vision. How would the rice noodles look on the light table? Well, the answer is...they looked fantastic! They weren't as transparent looking as I had hoped, but I loved how they looked on the light table. The boys finally had a chance to dig in and touch the noodles. At this point, they were damp, sticky, and somewhat squishy. K didn't care too much for the texture, so he lost interest after about five minutes. J, on the other hand, loved the feel of the noodles. He loved trying to roll all the noodles into a ball. And all those rainbow rice noodles scrunched up into a ball reminded me of a rainbow colored clown wig. Don't you think so too? Well, I bet you do now. Just a note: These noodles aren't meant to be stored over the long run. Instead, they're meant to be played with on the same day you make them. They were totally worth trying out, especially when the noodles only cost me $1. No they don't. They are usually made with rice flour and water and that's it!